The LabelStation Pro240 is a compact industrial specification printing system. It features a tough steel casing and a heavy duty die cast aluminium print mechanism. The LabelStation 240 has one of the smallest footprints in its class making it the perfect choice where working space is at a premium but the demand for labels is high. 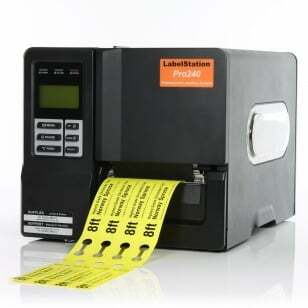 Unlike the desktop printing systems that have a clamshell case design, the LabelStation 240 has side opening access which make loading labels and ribbon very easy. Due to its relatively straight feed path, label jams are very unlikely and this also enables some of our heavier weight tags to be used with this printer. Supplied as a complete package which includes the printer, label design & print software, supply and associated cables.